While I went with a fairly traditional looking party for my Final Fantasy I playthrough I still had the option of combining the classes any way I saw fit. It makes me wonder how well some weird party combinations might work. The six classes to choose from are Warrior, Thief, Monk, Red Mage, White Mage, and Black Mage. All of them get upgraded to an advanced class when they get access to the crystals. After playing through about a forth of the game with my Warrior, Thief, White Mage, and Black Mage a few interesting party compositions came to mind. The main composition I want to know about is an all Warrior party. Warriors take almost no damage from attacks and dish out a ton of physical damage every turn. There's no mana management to worry about until they upgrade to Knights later in the game and obtain some minor white magic. I really think this is a viable party. At the other end of the spectrum a magic heavy party might work too. I think a Red Mage and three Black Mages might suffice. Four Black Mages would have no survivability because of their weak defense and low hit points, but a party front loaded with a Red Mage or two would stand a much better chance of succeeding. Another popular party I've seen on forums is three Warriors and one Red Mage. I'm guessing the Red Mage is there to pick up the undead killing spells and some heals. Undead seem to be the Warrior's only weakness because they randomly paralyze when they attack. I bet this composition would work really well. It makes me wonder what other crazy party combos might work. Here's a nice visual representation of all 126 of the possibilities. This many party possibilities is a novelty for old school RPGs and I'm impressed that a game from 1987 has such interesting party customization options. 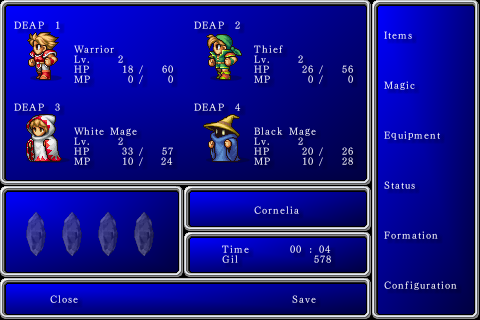 Personally I always rolled with a Warrior, Monk, Black Mage, and White Mage. Always. I know this is way late, but I always rolled with Fighter/*/Red Mage/White Mage, where * was your choice of another fighter, another red mage, or a black mage. Two fighters + the red mage would rip through any boss and most normal encounters, while doubling up on the black magic casters would bring large amounts of pain once you get the FIR2/LIT2 spells. I should start a new game and try out two fighters and two red mages. Bet that would be spectacular.